Anyone who lives in Arizona will dispute the notion that Arizona doesn't have a season for fall colors. As a matter of fact - there are many ways you can design your front and backyard to focus on the fall colors Arizona enjoys most. If you're looking to design a full color landscape in your Arizona backyard - begin by planning your trees. This will dictate the amount of shade and other features your landscape will offer to other plants. All of these have shown a hardy response to the cold, arid temperatures of the Arizona winter followed by the searing heat some areas can have in summer. There are a number of ways to incorporate them into your lawn landscaping. As a tip, you can complement your trees by planting flowers that explode into varieties of color in the fall. Zephtranthes, also known as Rain Lilies, burst into bloom from September through October, making them an excellent choice if you want your backyard full of Arizona fall colors. These tough little perennials are native to the plains in South America and Mexico. This beautiful late-season bloomer is perfect for Arizona landscaping. Named affectionately for their delightful habit of bursting into bloom after an early fall rain, this Rain Lily performs with a show-stopping flair. These colorful carpets do well with periods of drying out and watering that are common to our Arizona landscapes. When placed near a canopy of raging red fall leaves - the effect can be simply awe-inspiring! Also, if you don't receive much rainfall where you live, sink the primary planting areas by 6 inches in order to better capture the sparse rainfall. This approach can also solve problems for backward-sloping front yards – as these houses can flood during sudden heavy rains. Removing soil is almost always cheaper than having to install plumbing to divert runoff, and good planning means rain water irrigates plants for free. For more on this, read our article on How to Create a Beautiful Arizona Backyard Landscape on a Budget. Finally, make sure your grass lawn receives enough sunlight so as to promote healthy sod growth. 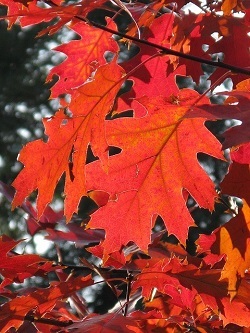 No sod can tolerate 100% shade, so keep this in mind when planting your gorgeous trees that turn red in the fall.